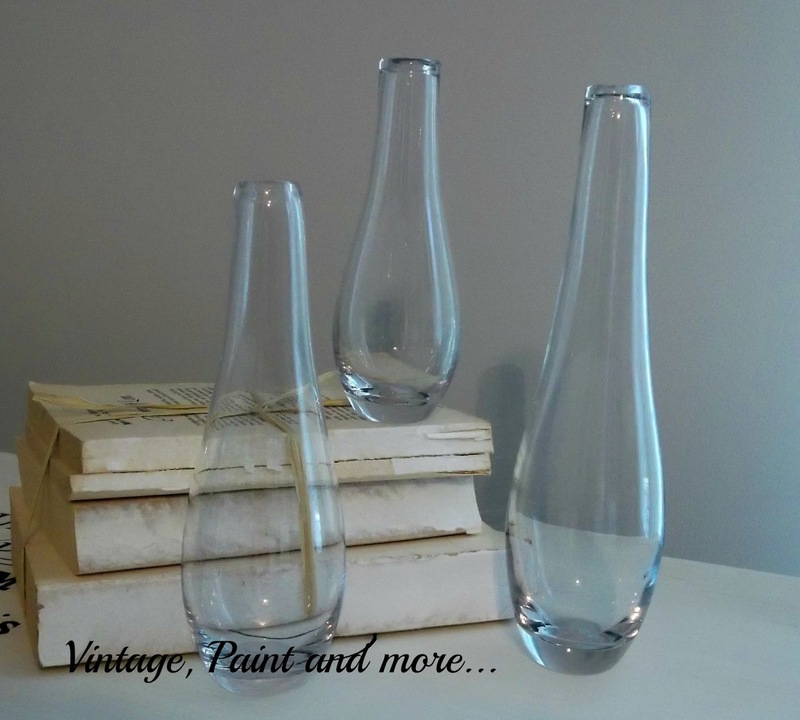 Today I am going to show you my new vases I just finished.. I did like their shapes. on several different types of bottles and vases. white paint in each of three small Dixie cups. and in the third one I tripled the amount of Denim paint I used in the first cup. I then mixed the paint in each cup well making sure I had a good ombre set of color. and rolled it around until it covered the entire inside of the vase. turned the vase upside down in another cup and let it drip for a while. second vase and the third cup of mixed paint for the third vase. I think they are so pretty and fit right in with my beachy decor. Do you think this is something you would like to try? I like, I like! Looks fun to make too! I L O V E this idea. I am headed out in a few minutes for some errands and I think I will stop by the thrift shop to see if I can find some interesting bottles. Yesterday when I was "tweaking" the living room, I thought it would be nice to have a green bottle. Now I know I can just make one. 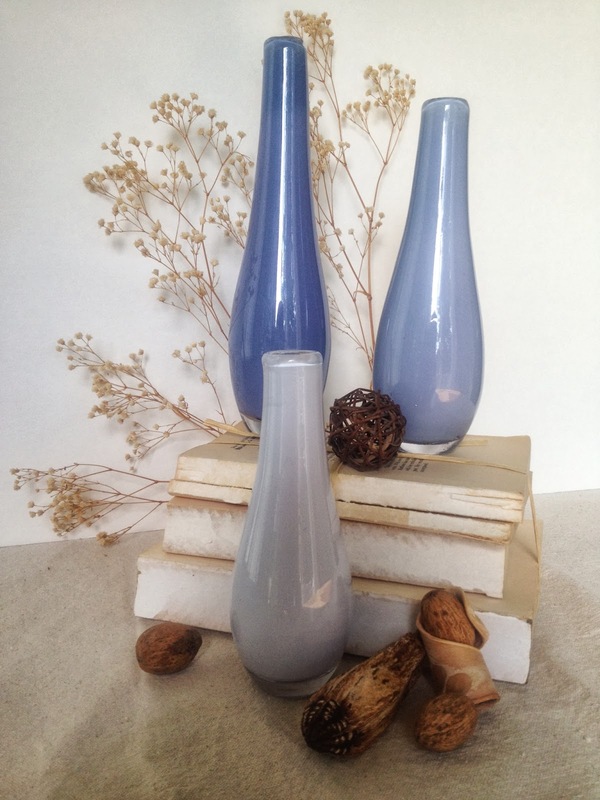 p.s these vases are gorgeous!!! Hi Cathy! 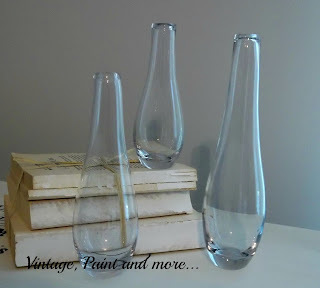 Thanks for sharing this GREAT technique for changing the color of glass vases. You make it sound easy and the look is wonderful because the outside of the vase is still shiny. I want to try it for sure. I saw your post over at Masterpiece Monday at Boogie Board Cottage. Thanks for sharing this NIFTY THRIFTY idea at my party this week. Great idea. Found you on the link party. I am dying to try this for some fall decorating. Going to try this upcoming weekend. Thanks. 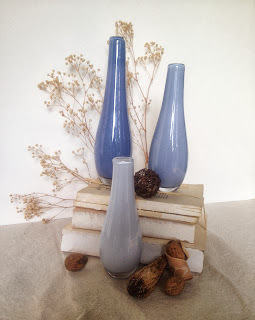 You can visit me at denisedesigned on fb, pinterest and on my blog. I will like and follow you on fb and pinterest as well. These is such a cool color scheme....Thanks for sharing..
these look so smooth and pearlized, to me. this is something I always want to try, so thanks for the great inspiration! These turned out beautiful! I’m visiting from All My Bloggy Friends! If you like to link up I’m co-hosting Tell Me Tuesday this week at http://www.craftdictator.com! I am so trying this Cathy - they turned out just gorgeous!!!! I LOOOOOOVE this. I'm in love with this vases, awesome job! Thanks so much for sharing this with me at Bewitch Me & Titi! Hope to have you back with another awesome share! Hope you are having a wonderful week!!! They look great! Thanks for stopping by DIY Vintage Chic’s Friday’s Five Features and Fun Festivities. Don’t forget to stop back by this Friday! Ooh so pretty! And you can't beat the price, that's for sure! 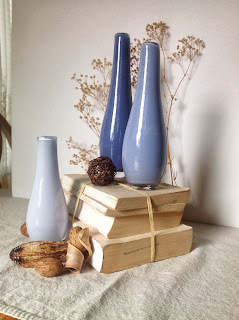 Thank you so much for linking up at "Get Your DIY On"! I hope to see you Sunday with your fall wreath! Have a wonderful weekend!